Choose a platform that properly fits each marketing message. Have you ever felt that you’ve exhausted traditional mar- keting practices and need to explore new ways to reach customers? You aren’t alone. Traditional marketing, while relying on well-known and proven tools, can fall short when deciding what mes- sage best communicates your most important news to the right target group. Additionally, marketing techniques that are heavily dependent on mass media can be costly. There is a solution — social media, the latest trend for capturing your target audience’s attention. Offline, traditional marketing strategies still serve a pur- pose, but they have limits in the mod- ern marketplace. The Internet — more specifically social communities such as Facebook, Twitter, and YouTube — provide new opportunities that help you to target your specific audiences. As a business leader, you need to be familiar with the different social media platforms and understand how they can help you to improve marketing and communication. Each platform provides a different and potentially profitable opportunity to grow your business if used in a way that takes advantage of how it works. in place. Determine what you are communicating with each tech- nique and how it is impacting both your business (as a purveyor of products and services) and the public (those who need to understand who you are and what you do). Some key questions to consider are: What are your core messages? What are you not communicating? Does your marketing focus on the business or the customer? Who benefits from the marketing methods? Do you invite audience relationships, or is it strictly one-way communication? How you answer these questions will help you to define your social media plan, goals, and anticipated results. Then, use those ideas to decide which social network will best work for your goals. Focus on the three most popular sites (Facebook, Twitter, and YouTube). You may find that more than one platform can work to your company’s benefit. That said, there are common objec- tives for each channel as well as different ways to measure their effectiveness with your audience. Facebook invites two-way communication and encourages true and honest feedback. Your business can communicate and interact in a setting that is more personable than the average marketing channel. According to Boston-based custom research firm Chadwick Martin Baily, Facebook has become the preferred method of sharing content on-line, second only to email. Therefore, it is ideal for community and relationship building, gathering customer insights and sharing news. Additionally, Facebook allows you to target messages to specific groups of people, especially those in different locations. The ability to narrow a target group also provides a more direct way to communicate with the most appropriate customers. Twitter shares many of the benefits of Facebook, but uses a method of communication that is concise and to the point. Best used for quick announcements and promotions, all posts are required to fit within 140 characters; yet such short messages can make a large impact. The two-way communication also allows you to quickly interact with customers and obtain instant feedback. From a developmental point-of-view, Twitter can be used to follow news from other industry professionals. It can be a source of information about trending topics within the business and provide a glimpse into how other companies use the network. It can be a launching pad for engaging in industry conversations or connecting with those who matter the most when it comes to your business development. Because of the real-time information stream, it gives you, as a business owner, the opportunity to inform customers (both current and new) of events and developments quickly and conveniently. If you go to a special event, share it via tweets or photos. The more you can share with your audience, the more value you are adding to your voice as a service provider within your industry. YouTube is a video channel useful for visually sharing information and educating others. Use the platform to create demonstrations of your services or simple how-to videos for easy do-it-yourself fixes. This platform is also a great way to visually showcase local customer stories. Adding a description about each video that focuses on the “Five Ws” (who, what, where, when, why) is another way to relate your services to your target end-user. Though this technique is not as in- teractive as Facebook for example, it is a strong way to show-case testimonials and illustrate that you are an expert in your industry. Each format provides benefits. First and foremost, with the growing popularity of social media, your business becomes widely available to the public. Through friend feeds, "like" capabilities, and online searchability, your business becomes accessible to a uniquely broad audience and gives you the means to more directly connect with customers. A presence on more than one platform lets you stay connected with users through multiple touch points, ranging from a website to a Facebook page. Once you have established your presence on the various social media platforms, integrating them into your overall marketing strategy can be a very valuable move. Cross-promoting these channels will not only help drive traffic to each page but also improve your search-engine ranking. 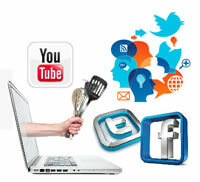 For instance, include a Twitter widget on your website or a mention of your YouTube channel in advertisements. Be it one outlet or many, social media can effectively open opportunities for your business to grow and develop into a leading player within your market. Lauren Whitson has worked for 1&1 Internet Inc. since 2009 as a communications specialist. Her efforts focus on informing small business owners and entrepreneurs about the benefits of bringing their business online and the power of utilizing Web-based tools to support their company’s success. Lauren Whitson has worked for 1&1 Internet Inc. since 2009 as a communications specialist. Her efforts focus on informing small business owners and entrepreneurs about the benefits of bringing their business online and the power of utilizing Web-based tools to support their company’s success. For more information about 1&1 and its services, visit www.1and1.com or contactpress@1and1.com.